Radial sailor, Lachy Grimwade, drew our attention to Sailing having been dropped from the 2020 Tokyo Paralympic Games. And the online petition where you can show your support for having the decision reversed. 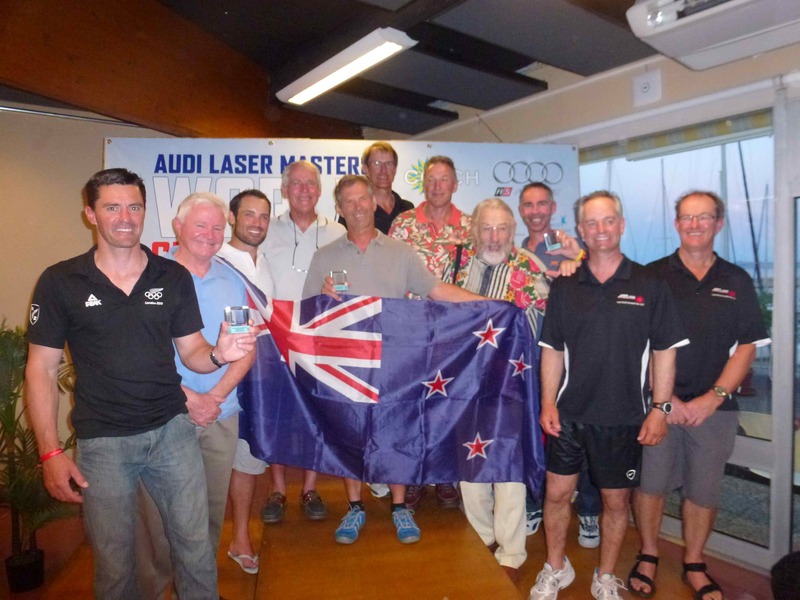 The 2015 Laser Nationals will be underway this Thursday at Takapuna Boating Club in Auckland. It has attracted an excellent fleet of over 150 across 5 divisions, with sailors from all over NZ and 20 overseas sailors from 15 countries registered so far. Final entries close on Thursday but with a couple of days to go a quality contest is assured in all divisions with a wide cross section of sailors registered including our Olympic aspirants and many current and past National and Masters World champions. In the Standard Open fleet NZ’s Olympic squad sailors, Sam Meech, Andy Maloney, Tom Saunders and Mike Bullot will be continuing their battle for ascendancy in the Olympic selection race. They have all been competing seriously on the world circuit and have all enjoyed top results in international regattas so will be keen to stamp their authority on the fleet in their home training ground off Takapuna. They will be tested by an up and coming group of NZ sailors, many recently graduated from youth ranks, and 10 overseas sailors from all corners of the globe. An extremely strong turnout of youth sailors in the Radial division are sure to push our 2012 Olympic rep and current National champion Sara Winther and the other female Olympic spot contenders as well as the Open Radial sailors. Several of the youths have just returned from the Australian Laser Nationals and Youth week where James Jennings and Alastair Gifford had good results. In the Masters Standard reigning champion Chris Decke is sure to be pushed hard by Andrew Dellabarca, fresh from a top performance at the World Masters in Hyeres. However he will not only face challenges from his normal NZ adversaries but also from visiting top UK GM champion Terry Scutcher. In the Masters Radials Scott Leith will again be hot favourite following his 2nd in Hyeres but he is sure to be tested by others including reigning World GM champion Mike Keeton. With a promising long range forecast all is set for 4 days of quality world class Laser racing off Takapuna, commencing with two scheduled races on Thursday. The results demonstrate close competition among the top NZ Laser sailors as we get further into the Rio Olympic cycle. NZ's Laser distributor The Watershed now has it's website online at http://www.nzwatershed.co.nz. The Masters regatta season got underway at Pupuke on Sunday with the North Harbour Masters. An excellent fleet of 28 turned up for the days racing, with big names from the recent Masters worlds, Scott Leith and Mike Keeton both in attendance. With Windguru predicting maximum gusts of 4 knots from the SW for the day all but 4 sailors elected to compete in the Standard rig. As it turned out we got what was probably the first sea breeze of the summer and while it topped out at about 8 knots, probably averaging about 5 knots, and was pretty shifty all day it did provide a good racing conditions and 4 quality races were completed. Not surprisingly given the very light conditions Radial sailors pretending they could muscle up and sail a standard rig dominated the competition. Scott, who’s 1,1,2 record enabled him to sit out the last race as his discard, gave us all a bit of a sailing lesson, clearing out at the start several times but then having to out guess the shifts and light patches to keep the fleet at bay to win overall and 1st Apprentice. Mike managed to get past Scott in one race and was pretty consistent in the others to finish 3rd overall and first GM. Second overall and first Master was the Whangarei lightweight flyer Roger Winton, who had a great day with 4 top results giving him a clear second. Top GGM was Ray Beale. In the Radials Kevin Welsh dominated the small fleet to win overall from local Georgi Yankov and legend Jim Quinn. The main contest of the day, the Rum spot prizes, were however dominated by true Standard rig sailors so order was returned to the regatta at the end of a great day. The strong turnout at this regatta bodes well for the season and with the North Islands at Napier, Sir Peter Blake at Torbay and the Nationals at Takapuna over the next few weeks we are all looking forward to some more well attended quality masters racing this summer. 4 cubes for NZ. Fantastic. The Day dawned with thunder, lightening and torrential rain which did not look like the formula for racing for the final day. However after a delay of an hour the skies had cleared and we had an 8 to 10 knot Easterly with quite a bit of chop for the final races. Some fleets had 2 races today while others only managed 1. The penultimate days racing had weather pretty much as forecast. We had an Easterly not quite as strong as expected and a bit patchy at times but on average a good 15 knot breeze with waves, very similar to the last few days. More of the same… really nice +/-15 knot on shore breeze with big waves. More pressure on the Southern Standard course that the Radials to the North and a bit more in the early races on both courses than the later. Conditions today were similar to yesterday but a wee bit lighter for the Standards. 15 knot Easterly with quite big waves were the order of the day, think Takapuna in a solid sea breeze but with bigger waves. Finally some breeze. Fleet launching was held until midday with the first starts on both courses at 1pm.